Apple loses patent ruling – ban on some iPads and iPhones | What Hi-Fi? Apple has lost a patent ruling against Samsung for the first time, leading to a ban on the import into the US of certain iPad and iPhone models. 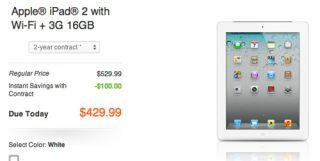 The breach of patent – relating to 3G wireless technology – affects older models of AT&T iPads and iPhones, which are now banned from import into the US. The ruling, by The International Trade Commission (ITC), concerns the AT&T models of the iPhone 4, iPhone 3G, iPhone 3GS as well as the iPad 3G and iPad 2 3G. The decision is final, however Apple has expressed disappointment in the ruling and the company is expected to lodge an appeal. The ruling could be reversed by a US presidential order within 60 days, with the White House holding the power to approve or disapprove the decision. "We believe the ITC's Final Determination has confirmed Apple's history of free-riding on Samsung's technological innovations," Samsung said in a statement. "Our decades of research and development in mobile technologies will continue, and we will continue to offer innovative products to consumers in the United States." Apple said it was disappointed by the ruling, with spokeswoman Kristin Huguet saying in a statement to AllThingsD: "We are disappointed that the commission has overturned an earlier ruling and we plan to appeal. Today's decision has no impact on the availability of Apple products in the United States." This is the latest example in a flurry of litigation battles between the two companies, who are locked in lawsuits in no less than 10 countries. Last August, Samsung was ordered to pay £1 billion in damages to Apple, later cut to $598.9m. Analysts believe Apple is trying to limit the growth of Google's Android system and, as a result, smartphone makers using the Android system, including HTC and Samsung, are now embroiled in various legal battles. Samsung is the largest smartphone manufacturer in the world, with analysts estimating it outsold Apple by roughly two to one in the first three months of the year, ahead of the launch of the Galaxy S4. Samsung has since sold approximately four Galaxy S4 phones every second.